We use Redirected Folders in Windows Server to allow users’ “My Documents” folder to be redirected to a file server. This prevents files being saved on vulnerable desktops by changing all access to “My Documents" to point to the server location. This enables Offline Files by default. Windows XP had a little icon that would appear in the Notification Area (a.k.a. System tray) to notify people they were working offline. This would also allow users to force a sync if they got back online via a VPN. The “Work Offline/Online” disappears from the toolbar when the user disconnects from the LAN. Fair enough ,you may think, as there is no way to go online if there isn’t a physical connection. However, when you connect to the VPN, the button should reappear and allow you to work online if you so desire. However, for us this wasn’t happening. There was no way to force Windows to accept that there was a connection. You could even access the files by going directly via the file servers’ UNC path or IP address but no joy through the DFS mapped drive. After a quick shout out on twitter it seemed that my followers were not experiencing any problems with the feature (including a few that work for Microsoft). Google told a bit of a different story with several forums full of problems with the Windows 7 + Offline Files + VPN combination. A few people had problems with share permissions or used a hotfix provided by Microsoft but none of these had any affect for my situation. I even trawled through the Windows 7 internal Help & Support, extensive TechNet documentation and every Offline Files group policy setting there is to see if I could find the root problem. After no success, and two working days later, I decided we would have to accept that it wasn’t going to work and it was time to give up. At just that moment I overheard a few colleagues talking about the impending IPcalypse and how they didn’t see what the need of IPv6 was. I started to explain why and gave examples of how Windows 7 uses IPv6 to accomplish new technologies like DirectAccess or HomeGroups that just aren’t possible using IPv4. Suddenly a lightbulb flashed above my head. One thing we have always done when setting up VPNs is to disable IPv6. As we were not using any IPv6 technologies all it would do is slow down the VPN connection time. Could it be that this was the one peculiarity that was preventing remote users from working “online”? Well after a bit of testing I am very pleased to say “Yes!”. 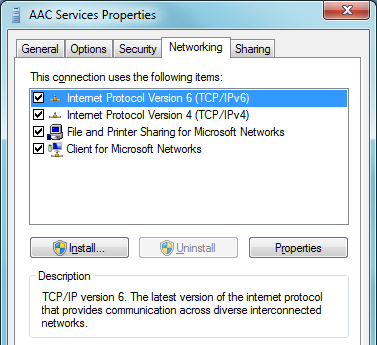 All you need to do it tick that little IPv6 box on the Networking tab of a VPNs properties (type “IP” in the start menu to view network connections). As soon as you connect to your company LAN the “Work Online” button will appear in Windows Explorer as well as giving you detailed Offline statuses in the details pane (e.g. slow link, offline, online etc.). You would not believe how relieved I was to find this solution. I couldn’t find any official documentation from Microsoft on Offline Files being dependant on IPv6 in Windows 7 so I guess I have just created it . It would be great if you could give me a shout out in the comments if you have experienced the same issue and if this tweak has fixed it for you. I had the same problem as you, but when I checked my VPN and Wireless adapter properties, they both had IPv6 enabled already. Sorry to hear that Ken, I was hoping this might be THE solution but obviously there are other things that can go wrong too. Does it work OK for you on Vista & XP machines? You may also want to try installing Service Pack 1 for Windows 7. The final version is now available to download if you have a TechNet or MSDN subscription but if not then I guess you will have to wait a couple of weeks until it’s released to the general web. Now with the Service Pack installed, I just connected with VPN, and the “Work Online” button appeared. Problem solved! I too have been intermittenly having the “missing Work OnLine Button” problem seemingly since I first installed Windows 7 and set up the Off-Line” files. The files actually live on WHS and it usually works quite well, but my work requires that I move around a lot, and would probably connect to several wireless networks before returning to base and often when I return I’m shown as “off-line” with no button to toggle back on-line. Since it usually works, I don’t see it as a permissions issue and none of the other fixes I found (you likely found also) make any difference. I was really hopeful when I found your suggestion, but alas my ip6 was already enabled, and I installed SP1 last week and encountered the problem again today. Back to the drawing board. Just to add to the trouble-shooting. It works “most” of the time, so I doubt that it’s an incorrect setting – settings usually either work or don’t work. A reboot always resolves it so it’s also “transitory”. Problems like this can be hard to find a proper resolution. My situation is that I redirect my main work folders to WHS shares (normally connected wirelessly at home), so that I can manage those folders from any pc at home, and any changes are reflected in the “offline” copy on my laptop while I move from site to site during my work. This normally works quite well. While working, I may connect to serveral different networks, mostly wirelessly (I have 136 saved wireless networks) before returning to my home network where the shares are. Due to the intermittant and transitory nature of the problem, I suspect Windows is somehow getting “confused” as to what network it is connected to, and not recognising the server as where the offline files live) and a reboot is the only solution. Sure would be nice to find a real fix, though. I had the same problem. My setup is like this: W2K8 SBS on Server, SonicWall TZ 190 using SonicWall Global VPN Client (GVC) 64-bit version on client. Client side, I have Win 7 Pro x64 w/SP1. I configured various folders on the server at the client as “Always Available” while the machines were both on the same network segment where the server is located. Then, I shipped the PC to a remote office, and using the GVC, connect back to the firewall. This is where the problem started. The first thing I noticed, was that after connecting to the firewall via the VPN, and after the login scripts execute, I can see all mapped drive letters as ONLINE for a few minutes. Then, they disappear, or rather go offline because Win 7 thinks the connection is too slow to support online state. With Win XP Pro, this was never an issue. I found this article, and sure enough the VPN network adapter on the client had IPv6 enabled by default. I disabled IPv6, and rebooted the remote win 7 client, and now I don’t have any problems with offline files anymore. I have to test over the next 7 days to be sure with the user, but at least it is behaving at this point. I had ip v6 disabled on the server, and have now enabled it after reading your post. I will have to test more but I am hoping we can keep this thread alive, because VPN + offline files + mixed environment is WEIRD…. servers are 2008 r2 and clients range from XP to windows 7. Does anybody know if there is a way to force Windows 7 to work online once on VPN? We are not having a problem with the “Work Online” button, but just want to have the computer go online automatically over vpn. AFAIK if the connection is there then it should switch to “online mode” if it successfully completes a sync. You may have a “slow connection” causing the laptop to stay offline. It shows you in the Windows Explorer details pane if this is the case. You can adjust the slow link detection through Group Policy. You could also create an advanced Sync Schedule from the Offline Files control Panel in the Sync Center. This has options to sync more frequently. That’s all I can think to check. Let me know if you have any success. I have a SPECIFIC share that I am receiving the “slow connection” for. ALL other shares on the same server are unaffected. This occurs only form a specific Win 7 client. If I disable offline files, the shares contents are shown no problem. I have the same issue, but on my home network. I don’t have VPN. Last year I found that changing the hard drive sleep state under Control Panel, Power Options, Change Plan Settings, Change advanced power settings, Hard Disk, Turn off hard disk after …. NEVER helped some, but it hasn’t eliminated the problem entirely. I’ve been having this “offline” problem on our domain ever since moving to Win7, and 90% of the problems have been on desktops that never leave the network. Most systems are on 100Mbps connections or slower, but my biggest offender is connected at 1G. Ever since disabling IPv6 she seems to be okay. Thank you all for the suggestion!! I’d love to know how gmandutch’s testing is going. Should I start pressing our Network Admin to apply a server-based fix, or just keep disabling IPv6 when I get calls? OK I have tried many things and one of them is turning on IPv6. How ever it still doesn’t work. not even locally. So my question is. Do we have to configure an IPv6 GW and a DNS or is it enough the the servers and the client have gotten a IPv6 assigned? I just had to have it enabled on the client. There isn’t any kind of gateway or server for IPv6 except the default (unused) one that appears when you set up DHCP on a server. I had a similar problem and first discovered it when I was connected via VPN, but what really seemed to happen is that my files stopped syncing after I had to change my network password because it expired (and my machine is not joined to the domain because I do use it remotely). I noticed this because the non-synced files were black in Windows Explorer, not blue. I deleted my password from the Credential Manager control panel (which showed that the password for the share in question had not been changed for a few month, yet I’d changed my network password a few weeks ago), and then just cut and pasted all the files from the folder onto my desktop, then after a few restarts the folder started showing as Online again I copied back in the files I needed. So it seems like it’s a glitch that it if it can’t sync up it will never go back online, and a password change can prevent it from syncing up (and it won’t necessarily prompt for a new password). Hey you are the man!!! Not only have the problem, I have the same environment. All my users’ “My Documents” are located on a server, thus we always are working offline. I’ve have this setup for quite some time and alwasy worked like a charm, with Windows XP. And then….. Windows 7 happens. Alwasy wandered how to force the sync and now you got it. With a setup I would never suspect in zillion years. I verified that you must disable the IPV6 option/config from either your VPN adapter or your Wireless adapter (or both if you’d prefer). Note: If you still do not see the Explorer “Work offline/online” option/button, go into the Sync Center > Manage offline files > Disk Usage [tab] and “Delete temporary files.” Many thanks for all the info! Thank-you for this info to find the “magic” button. Also, to get this working on my system, “ticked / unticked” the IPv6 option, but what really got it working for me was insuring that I had the same password on the client, VPN & NAS box. Windows 7 laptop leaves the site works fine offline but would never come back online when onsite again. Tick the box and away it went. I am getting really p….. at this f…… problem. It’s not the same problem for all the users. I can make a test setup and it works for weeks but the suddenly it stops working and the next day some users can use it again for a couple of hours and then it stops again. I got in touch with someone from Microsoft UK about this. His response was “It works fine for us”. I think that shows you how concerned they are about the problem. I know companies that ignore Offline Files & Folder Redirection completely because of the headaches it causes. They keep everything local and back up users laptops just in case. Hardly ideal but at least that works! My problem isnt that the customer “doesnt” see the Work Online/Offline button, they dont want to manually push that button. If they works “offline” towards the company network and then connect via whatever connection and further connects with their VPN solution, they want to have all their files/folders on their (home) share, H: accessible. Is this possible? I haven’t quite got the Work Offline to reappear with the VPN online, but, I did notice some things… enabling ipv6 on the VPN adapter wasn’t enough, I had to reenable it on the lan adapter as well. Warning – Offline files, since then, seem to have consumed a LARGE amount of data in order to Sync. Has anyone else experienced this? This wouldn’t be an issue on a hotel Wifi, other lan, etc, where you fire up your VPN and ignore it, but I was tethered to my 3G wireless device, and have now incurred 7Gb of data charges. Is there a log for offline files, where I coud validate this? Should offline files be creating this kind of serious traffic when it does the background sync? I have probably …. 150Gb on the server. Of that, 8gb is marked avaialble for offline use. All was 100% in sync when I left 2 days ago, and only one file has changed, and it’s size isn’t significant. With ipv6 disabled on the VPN adapter, it still allowed me to “Work Online”, and sync ran. Ok, with ipv6 disabled both to the LAN adapter, and VPN adapter, and a full reboot imbetween, the Work Online button is still there, and background sync of some sort is still happening. I guess that once you’ve had the ipv6 up at least once, the system has cached this somehow? It certainly does not need it, to keep operating. Very strange… but work online came up within seconds of establishing the vpn, and checking that by pinging the server by name. with some investigative explorations, I have witnessed the following. When I click “work online”, they start to show as normal folders, and net traffic goes crazy. But, it doesn’t stop. It keeps going. I even clicked “Work Offline”, and the folders went back to expected behavoir, but the traffic kept going and going on the VPN. 80%, 90%, of a 3Meg connection – can you smell the money flying through the air? By killing explorer.exe it stopped dead, and did not come back when I restarted the task. This generated very little traffic for about 3 mins, then 30% of the VPN for another 3 or so, and then went quiet again. Killing explorer while it was Syncing, had no effect. Stopping the Offline Files service while it was syncing, stopped it, as expected. I started it a second time, and let it finish. Sync start 129pm, sync stop 136pm. So, the question I think that I am left with, is, does selecting Work Online, from explorer, trigger some massive exploration crawl and catalogging of files that might be possibly reachable on one’s server source? Which for me, hurt for sure, but for others could be fairly catastrophic to a data plan? Long time has passed but i would like to thank you for putting this online because i met the same problem as you and enabling ip v6 in the network settings of the ssl vpn connection (fortinet ssl in our case) really solved the case. Great help, thanks a lot !! For those with Forticlient SSL VPN client, IP V6 is now reenabled at the next connexion so the solution is only temporary BUT both buttons “Synchronyze now” and “Work Online” reappear 120 seconds after the VPN connection is up. I did not find any tweaks to shorten this yet. This worked for me. I was about to throw a chair through a window and decided on one more google search. THANK YOU. Thanks Thommck, This was the fix I needed to get that button back for one of our users. Untill I found this I had no clue this could have been caused by disabling IPv6 previously. When you connect in via VPN and open Windows explorer you may notice that only the Folder set to be available offline is available and the rest have a Grey X through them even though you are ONLINE. No worries, its driven me mad for days so thought I’d share. One point to note is, the network drive needs to be permanently mapped not just mapped using a logon script. To get solved, means as soon VPN is up = network drives with and without offline files get online. To do that, I had to switch on option off in the global profile options. Run gpedit.msc from run task in start. Navigate down from Computer to administrative templates, network, offline files to the option ‘configure slow link mode’. You have do disable!! this option. After a reboot it will work. Navigate by explorer to the network drive – no connectin. After VPN is up, connection get online in seconds. 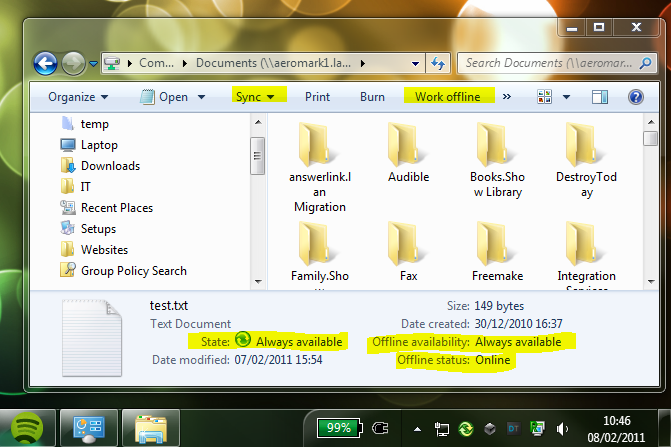 Ive not even see any ‘Work Online’ option with Offline Files under Windows 7. In case it helps anyone – to get a direct connection to the server over a VPN when Offline Files is enabled – and blocking you accessing the live files and folders – you can create a new shortcut to the share but use the IP address instead of hostname – e.g. ‘\\192.168.1.200\sharename’ to a share you have access to. This bypasses the local set of offline files. Thanks for the Article and the comments here. I was having the same issue with one laptop and after pouring through KB’s patches, hotfixes, disabling slow link and reg key changes etc.. nothing really seemed to work for the offline files over the VPN. My fix was the opposite as the article since IPv6 was already enabled I decided to just disable it, and so far so good for my user. I should also note that no issues were seen when we had an Anyconnect VPN running at the site. Thanks again and hope others find this as useful as I did. Yes the GPO with the slow connection is it…. Thank you! We have exactly the same issue here, except we are running windows 10 pro and have the same issue. We have a fortigate SSL VPN that we are using and if a user has any offline files turned on at all, no mapped drives work online once connected via VPN. If you have offline files disabled, and reboot, then the mapped drives works great. This has something to do with how our mapped drives are mapped via DFS, and then marked as offline folders (Always available offline). Turning on IPV6 has not solved this issue for us at this point. I have tried a few different configurations with regards to some and all the NICs/VPN adapters. Nothing is working at this point. It is such a strange error for sure. Any ideas on how to further troubleshoot this? Next I am going to try turning off IPV6 on all adapters, rebooting and reconnecting, but it is frustrating for sure and it is “nice” to see others with this issue. It is difficult to pin point when it could be any number of things: windows security, VPN settings, Workstation settings/firewalls, VPN firmware, Server security, network protocols, etc. I am glad some of you are getting it working. I need a fix ASAP.